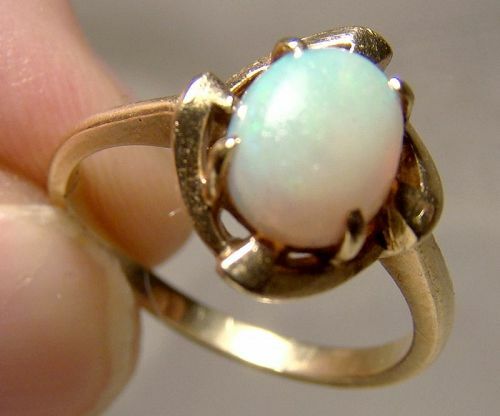 A 10k yellow gold oval opal ring from the 1960s. This size 6-1/2 ring features a nice natural oval opal with excellent translucence and orange fire with green and blue flash. It is claw-set in a 1/2 x 3/8" setting and it weighs 2.4 grams. It is stamped 10K EJ and it is in very good condition with no chips, cracks, dents, bends, corrosion, damage or repairs other than a light dulling patina from wear on the stone. All items are thoroughly and conservatively graded and all condition issues are noted; all items are vintage or antique and may have slight signs of gentle use. Expedited tracked and insured parcel shipping to the U.S. starts at $21 (other spots may vary, air is higher). Items paid with a credit card will be shipped to confirmed addresses only. We do ship internationally. All of our prices are in $US. PLEASE NOTE: We DO NOT accept PayPal. A 10k yellow gold blue sapphire and diamonds flowerhead style ring from the 1970s 1980s. 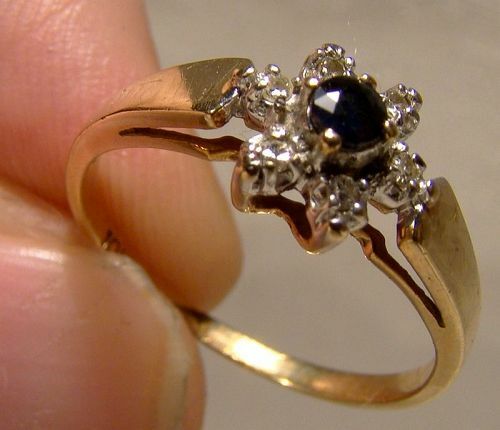 This size 6 ring features a deep blue 5 point sapphire surrounded by 6 single point diamonds in a 1/4" across setting. This ring weighs 1.7 grams, it is stamped 10K and it is in excellent condition with no chips, cracks, dents, bends, corrosion, damage or repairs. All items are thoroughly and conservatively graded and all condition issues are noted; all items are vintage or antique and may have slight signs of gentle use. Expedited tracked and insured parcel shipping to the U.S. starts at $20 (other spots may vary, air is higher). Items paid with a credit card will be shipped to confirmed addresses only. We do ship internationally. All of our prices are in $US. PLEASE NOTE: We DO NOT accept PayPal. 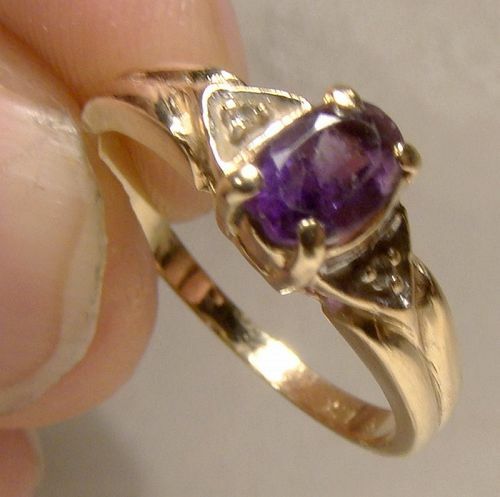 10k yellow gold amethyst and diamonds ring from the 1980s. This size 6 ring features a claw-set amethyst flanked by two single point diamonds in a 1/2 x 1/4" setting. This ring weighs 1.9 grams, it is stamped 10K and it is in excellent condition with no chips, cracks, dents, bends, corrosion, damage or repairs. All items are thoroughly and conservatively graded and all condition issues are noted; all items are vintage or antique and may have slight signs of gentle use. Expedited tracked and insured parcel shipping to the U.S. starts at $20 (other spots may vary, air is higher). Items paid with a credit card will be shipped to confirmed addresses only. We do ship internationally. All of our prices are in $US. PLEASE NOTE: We DO NOT accept PayPal. 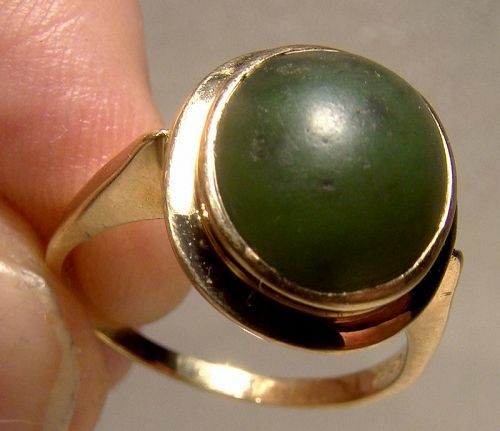 A 10k yellow gold nephrite jade cabochon ring from the 1960s. This size 7-1/2 ring features a bezel-set oval cabochon jade stone in a 9/16 x 1/2" setting. This ring weighs 4.7 grams, it is stamped 10K UNITY with a B in Omega maker's mark. It is in excellent condition with no chips, cracks, dents, bends, corrosion, damage or repairs. All items are thoroughly and conservatively graded and all condition issues are noted; all items are vintage or antique and may have slight signs of gentle use. Expedited tracked and insured parcel shipping to the U.S. starts at $23 (other spots may vary, air is higher). Items paid with a credit card will be shipped to confirmed addresses only. We do ship internationally. All of our prices are in $US. PLEASE NOTE: We DO NOT accept PayPal. 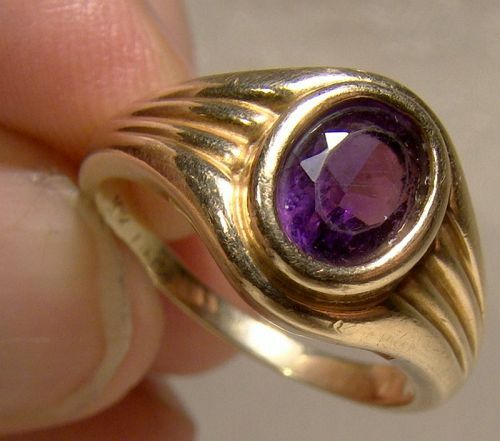 A 10k yellow gold LibCo amethyst ring from the 1990s. This size 7-1/4 ring features a bezel-set faceted amethyst in a stylish setting. The setting is 7/16" wide across the stone, the ring weighs 4.1 grams and it is stamped 10K LibCo (a 1987 trade mark of the Corona Jewellery Company of Toronto). This ring is in excellent condition with no chips, cracks, dents, bends, corrosion, damage or repairs other than some slight scratches and wear to the stone from use. All items are thoroughly and conservatively graded and all condition issues are noted; all items are vintage or antique and may have slight signs of gentle use. Expedited tracked and insured parcel shipping to the U.S. starts at $22 (other spots may vary, air is higher). Items paid with a credit card will be shipped to confirmed addresses only. We do ship internationally. All of our prices are in $US. PLEASE NOTE: We DO NOT accept PayPal. 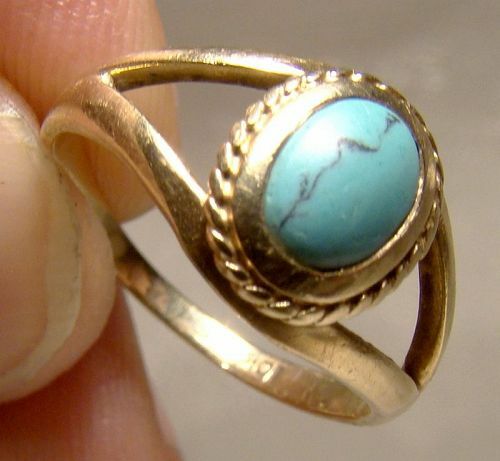 A 10k yellow gold turquoise cabochon ring probably from the 1960s. This size 5 ring features a bezel set turquoise stone with an internal black line. The setting measures 3/8 x 5/16", it weighs 2.0 grams and it is stamped 10K. It is in excellent condition with no chips, cracks, dents, bends, corrosion, damage or repairs. All items are thoroughly and conservatively graded and all condition issues are noted; all items are vintage or antique and may have slight signs of gentle use. Expedited tracked and insured parcel shipping to the U.S. starts at $20 (other spots may vary, air is higher). Items paid with a credit card will be shipped to confirmed addresses only. We do ship internationally. All of our prices are in $US. PLEASE NOTE: We DO NOT accept PayPal. 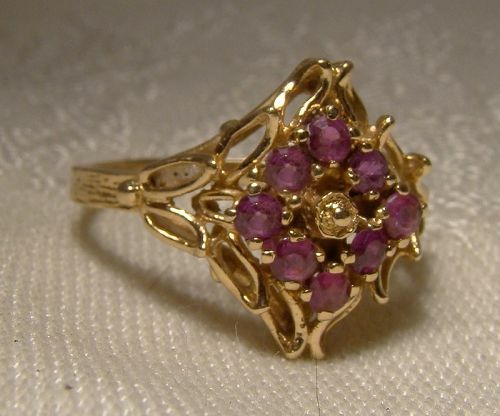 A 10k yellow gold rubies ruby cluster openwork ring from the 1960s. This size 7-1/2 ring has a nice openwork design and it includes 7 pink ~4 point rubies on the 3/4 x 5/8" setting and this ring has sculpted shoulders. It is stamped 10K LURAY, it weighs 3.3 grams and it is in excellent condition with no chips, cracks, dents, bends, corrosion, damage or repairs. All items are thoroughly and conservatively graded and all condition issues are noted; all items are vintage or antique and may have slight signs of gentle use. Expedited tracked and insured parcel shipping to the U.S. starts at $22 (other spots may vary, air is higher). Items paid with a credit card will be shipped to confirmed addresses only. We do ship internationally. All of our prices are in $US. PLEASE NOTE: We DO NOT accept PayPal. 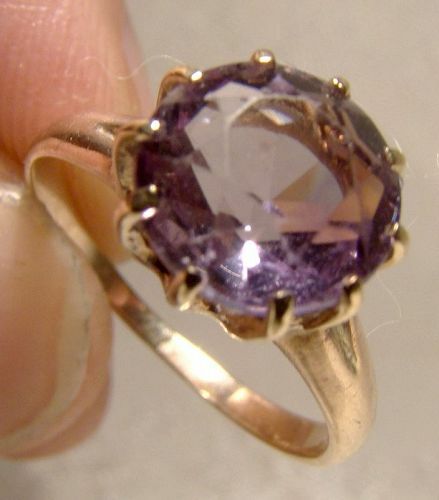 An Edwardian 12k rose gold amethyst ring circa 1910. This size 5-1/2 ring features a large light purple 5/16" solitaire amethyst with high claws on a simple shank. It weighs 2.0 grams, it is unmarked (and shows signs of resizing which may have obscured the marks) and it tests as 12k gold. The stone is approximately 1.5 carats (calculated) and this ring is in excellent condition with no chips, cracks, dents, bends, corrosion, damage or repairs. All items are thoroughly and conservatively graded and all condition issues are noted; all items are vintage or antique and may have slight signs of gentle use. Expedited tracked and insured parcel shipping to the U.S. starts at $22 (other spots may vary, air is higher). Items paid with a credit card will be shipped to confirmed addresses only. We do ship internationally. All of our prices are in $US. PLEASE NOTE: We DO NOT accept PayPal. 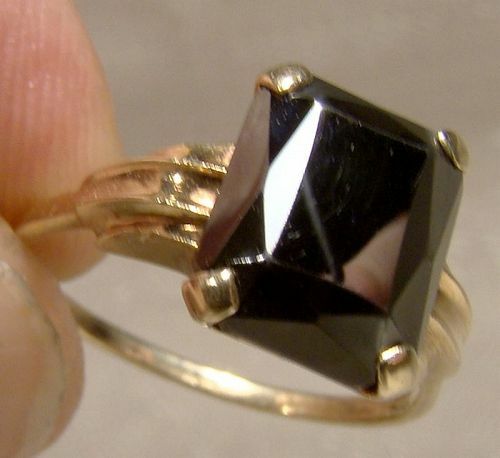 A 10k black Alaskan diamond hematite ring from the 1950s. This size 6-1/4 ring features a claw-set emerald cut 7/16 x 5/16" stone and it has fancy shoulders. It is stamped 10K, it weighs 2.2 grams and it is in excellent condition with no chips, cracks, dents, bends, corrosion, damage or repairs. All items are thoroughly and conservatively graded and all condition issues are noted; all items are vintage or antique and may have slight signs of gentle use. Expedited tracked and insured parcel shipping to the U.S. starts at $20 (other spots may vary, air is higher). Items paid with a credit card will be shipped to confirmed addresses only. We do ship internationally. All of our prices are in $US. PLEASE NOTE: We DO NOT accept PayPal. 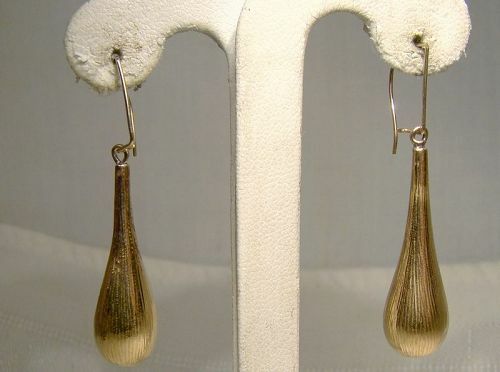 A pair of 18k yellow gold dangle drop earrings. These elegant 1-5/16" long earrings are in the shape of an elongated drop of water and they have a textured striated finish. They are 3/8" across at their widest, they include 10k ear wires and they weigh 4.0 grams (including 0.2 grams for the ear wires). They are unmarked and test as 18k and 10k gold. They are in excellent condition with no bends, corrosion, damage or repairs however they have a shallow small dent and one has a shiny flat spot where it was tested for gold content. All items are thoroughly and conservatively graded and all condition issues are noted; all items are vintage or antique and may have slight signs of gentle use. Expedited tracked and insured parcel shipping to the U.S. starts at $23 (other spots may vary, air is higher). Items paid with a credit card will be shipped to confirmed addresses only. We do ship internationally. All of our prices are in $US. PLEASE NOTE: We DO NOT accept PayPal. 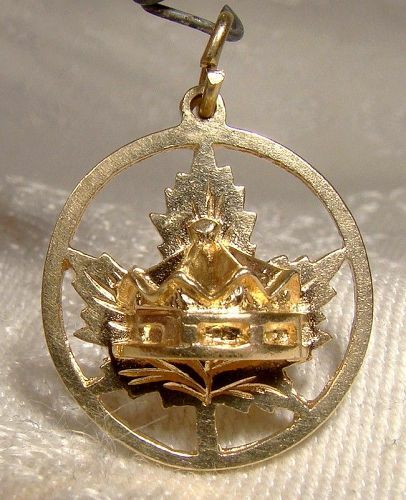 A 10k yellow gold Stratford, Ontario Shakespeare Festival Theatre charm pendant from the 1950s 1960s. This well executed, finely detailed 3/4" charm depicts the Festival Theatre in Stratford, Ontario, Canada which hosts the world famous Shakespeare Festival. It is mounted on an incised maple leaf and this charm weighs 3.8 grams. It is stamped 10K EJ STRATFORD and it is in excellent condition with no chips, cracks, dents, bends, corrosion, damage or repairs. All items are thoroughly and conservatively graded and all condition issues are noted; all items are vintage or antique and may have slight signs of gentle use. Expedited tracked and insured parcel shipping to the U.S. starts at $20 (other spots may vary, air is higher). Items paid with a credit card will be shipped to confirmed addresses only. We do ship internationally. All of our prices are in $US. PLEASE NOTE: We DO NOT accept PayPal. 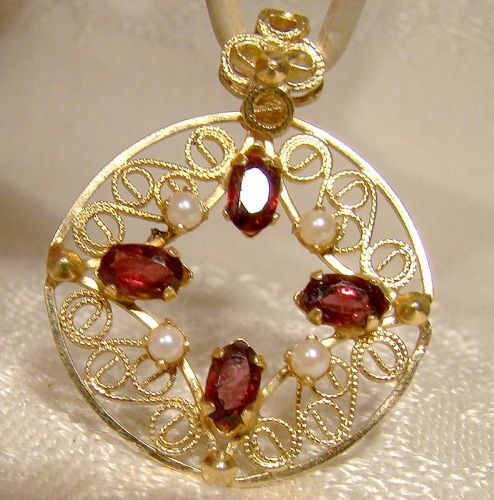 A 14k yellow gold garnets and pearls round pendant or charm from the 1970s. This unmarked (but tested) 1-1/4 x 1" (including bale) large charm pendant features four claw-set red garnets and four claw-set 2.2 mm. cultured pearls. It has a wirework filigree style and it weighs 3.2 grams. It is in excellent condition with no chips, cracks, dents, bends, corrosion, damage or repairs. All items are thoroughly and conservatively graded and all condition issues are noted; all items are vintage or antique and may have slight signs of gentle use. Expedited tracked and insured parcel shipping to the U.S. starts at $22 (other spots may vary, air is higher). Items paid with a credit card will be shipped to confirmed addresses only. We do ship internationally. All of our prices are in $US. PLEASE NOTE: We DO NOT accept PayPal. 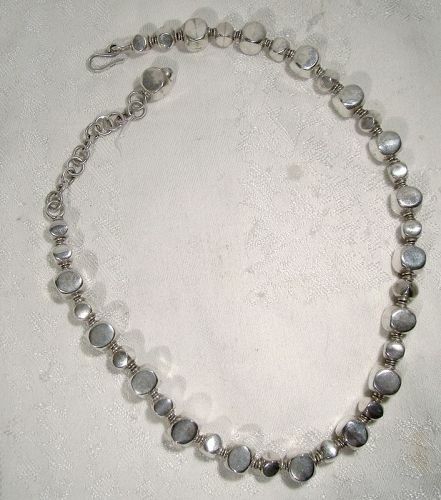 An Ilaria Peru 950 silver bead necklace weighing 60.2 grams. 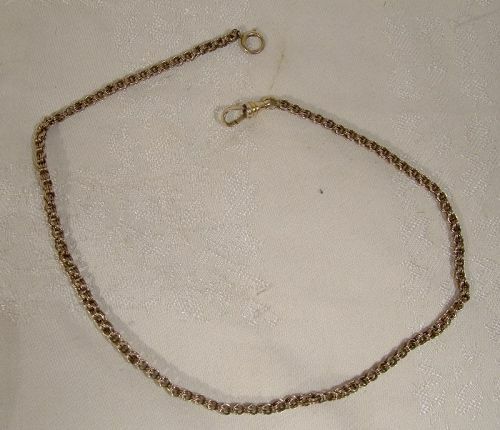 This rustic and substantial 19" strand necklace has a hook and eye clasp so it is adjustable down to 16". The squared off large beads are 3/8" across, they have silver loop spacers and the hook is stamped ILARIA 950. It is in excellent condition with no dents, bends, corrosion, damage or repairs. All items are thoroughly and conservatively graded and all condition issues are noted; all items are vintage or antique and may have slight signs of gentle use. Expedited tracked and insured parcel shipping to the U.S. starts at $22 (other spots may vary, air is higher). Items paid with a credit card will be shipped to confirmed addresses only. We do ship internationally. All of our prices are in $US. PLEASE NOTE: We DO NOT accept PayPal. A 10k white gold sapphire and diamonds ring. 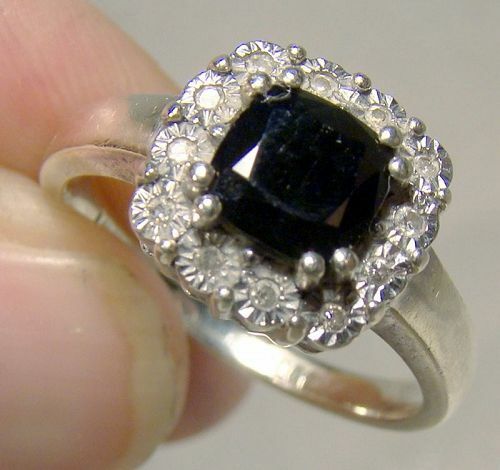 This size 7-1/4 or 7.25 ring probably dates to the 1980s or 1990s and it features a cushion cut dark blue genuine sapphire surrounded by 12 small diamonds which are the centre of small flowers. The sapphire is 1.1 carats (calculated) and the diamonds are single point. 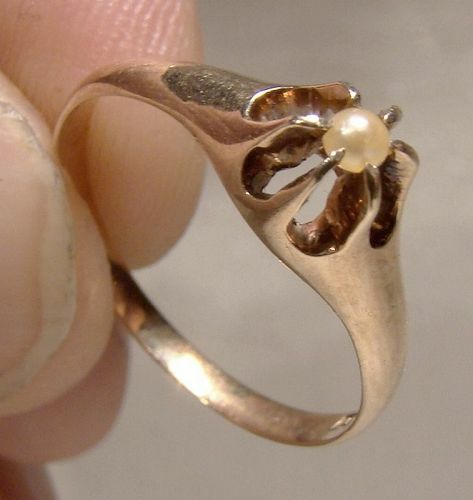 This ring weighs 3.6 grams, it is stamped 10Ct with a manufacture mark. It in excellent condition with no chips, cracks, dents, bends, corrosion, damage or repairs. All items are thoroughly and conservatively graded and all condition issues are noted; all items are vintage or antique and may have slight signs of gentle use. Expedited tracked and insured parcel shipping to the U.S. starts at $21 (other spots may vary, air is higher). Items paid with a credit card will be shipped to confirmed addresses only. We do ship internationally. All of our prices are in $US. PLEASE NOTE: We DO NOT accept PayPal. 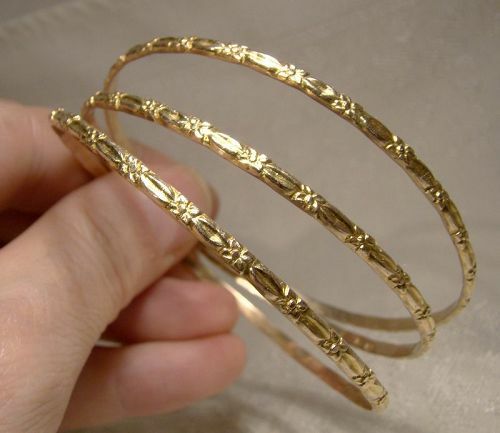 A group of 3 10k yellow gold bangle bracelets with a floral motif. These attractive 1/8" wide identical bangles measure 2-9/16" across the interior and they are 1/16" thick. The three weigh an impressive 23.0 grams, they are stamped 10K with an M maker's mark and they are in excellent condition with no dents, bends, corrosion, damage or repairs. All items are thoroughly and conservatively graded and all condition issues are noted; all items are vintage or antique and may have slight signs of gentle use. Expedited tracked and insured parcel shipping to the U.S. starts at $34 (other spots may vary, air is higher). Items paid with a credit card will be shipped to confirmed addresses only. We do ship internationally. All of our prices are in $US. PLEASE NOTE: We DO NOT accept PayPal.